Recap of December2017: The month of December saw a healthy growth by broader indices with Nifty, Nifty 500, Nifty Mid Cap and Nifty small cap growing by 2.97%, 3.67%6.62% and 4.37% respectively. Among sectoral indices, Materials, Industrials, Consumer Discretionary, Consumers Staples, Healthcare, Information Technology and Telecom were major gainers and rose by 4.86%, 5.44%, 5.92%, 4.06%, 5.83%, 5.03% and 6.86% respectively. Other sectors namely Energy, Financials and Utilities also ended up in positive and grew by 2.01%, 0.84% and 3.24% respectively. The month of December was yet again a classic case of Mean Reversion i.e. stocks which were gaining in last few months performed poorly while stocks which fared poorly during last few months performed well.Stocks with Earning Score (ES) above 70 (at the end of November) rose by median of 3.94% whereas stocks with Earning Score (ES)below 30 (at the end of November) grew by median of 6.09%. Stocks with Price Score (PS) above 70 (at the end of November) rose by median of 4.1% whereas stocks with Price Score (PS) below 30 (at the end of November) grew by median of 6.76%. 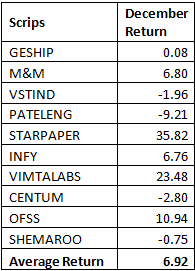 And these stocks gave average return of 6.92% in December.